Scratches, whether minor or major, lessen the appeal of even the most expensive and brand new vehicles. The slightest chipping can make matters worse. If you wake up to find your car with these unsightly marks, don’t fret. Pull yourself together and bring your car to the Pompano Beach Auto Paint Refinishing experts at B&R Auto Body Works. Many car owners get involved in vehicular accidents every year. B&R Auto Body Works Pompano Beach Auto Paint Refinishing services restore scratched car paint to a glossy shine. But you don’t need to get caught up in an accident just to avail of our services. If your car still runs great but looks the worse for wear, you can have your dull or faded auto paint updated with your favorite shade to bring new life to an old car. But always remember that you need to select an auto paint shop very carefully. Proper Pompano Beach Auto Paint Refinishing is a multi-step process that must be carried out under very controlled conditions to get the best results. Begin by creating a list of the shops providing the specific service that you want. You can include the adjacent ones but you may also want to check out other options such as the auto refinishing shops in the next city or town. Trim down your prospects by considering factors such as price, kind of service and level of expertise of the technicians. The perfect choice would be a shop close to your home and that gives high-quality services by skilled technicians at an affordable rate. Another way to find the best auto refinishing shop is to ask for referrals from your family members and friends who are regular clients of the industry. The experience that they had can aid in your search as they would not point you to a shop if they didn’t like the results of the service there. 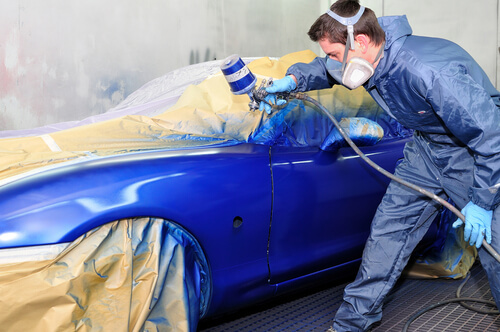 If you are residing in South Florida, there will be the high chance that they would recommend dropping by one of the best Pompano Beach Auto Paint Refinishing shops, B&R Auto Body Works. Rest your worries and let the certified technicians at B&R Auto Body take care of the job for you.